Here is a recent commission I completed for Rossall School. The painting now hangs in the school hall along with the pictures of all the past headmasters. 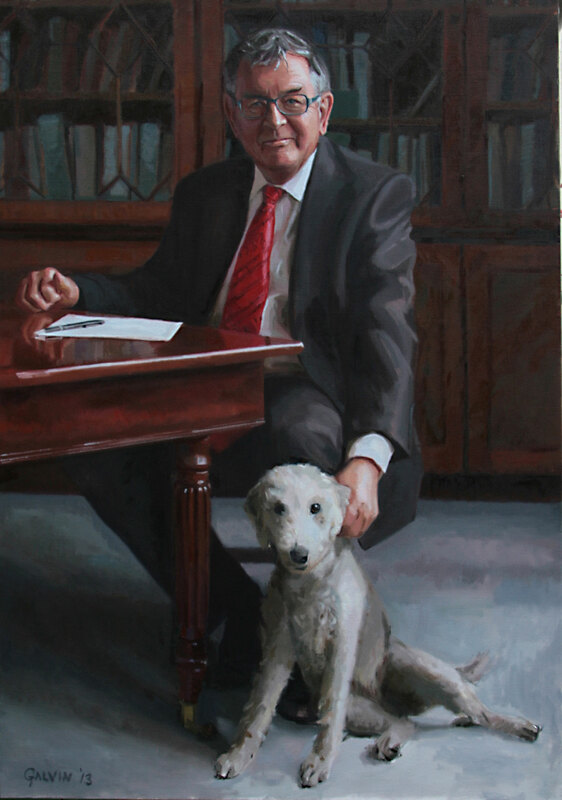 The dog in the painting is the Headmasters pet Bluebell, a school celebrity! I had a great time visiting Dr Stephen Winkley and Bluebell the dog. They were both great company and very easy to work with. They happily accommodated my many artistic requests. Thank you to both sitters, and Rossall School. Heres my set up for the painting, looking up and out from the river bank through the trees. Landscape painting offers up many different challenges to studio based work. First amongst these is finding the right subject to paint, which can be surprisingly difficult when confronted with so much to choose from. For me personally its really helpful to get to know a landscape, and develop a feel for the place before beginning. When I’m painting outdoors,the changing weather conditions, and the changing light force me to make decisions a lot quicker than I would in the studio. This I like as it makes me work a little more intuitively, and feeds back into my studio work. Often the pictures are smaller because of the practical difficulties of working outside, but I have plans to make larger works in the future. The photos are of a recent painting trip to the river Usk in Wales. I went there with the intention of making some studies of the river bank and the moving water, but ended up settling on a view looking out from the river bank towards the nearby fields. I think I wasn’t happy with my preconceived idea of what I wanted to paint, as it was inhibiting how I approached the subject. I like it when I find unexpected subjects, it makes the whole process feel more spontaneous, and challenges my way of thinking, keeping things fresh. In 2007 I was awarded the first Bulldog Portrait Bursary by the Royal Society of Portrait Painters. Since then, 2 other people have received the Bulldog Portrait Bursary, and submissions are now open for the 4th bursary. I thought that with this blog(and before too much time has lapsed), it would be a good opportunity to review the year I had in London on the Bursary, and give an insight into what I did in the Bursary year. I have already summarised the year in an article that was published in the 2009 Royal Society of Portrait Painters Annual Exhibition catalogue, but I’d like to make that information available here, where it can generate some discussion. The basic idea of the bursary is to support an “up & coming” artist, through mentorship provided by members of the Royal Society of Portrait Painters. There is a monetary prize that is provided to help support the winner during the bursary year. Heatherley’s School of Art provide free access to some of their courses, and there is a possibility of renting studio space at the Art Academy, and accessing their facilities and courses. When I won the bursary I decided to relocate from Cardiff to London to rent a studio at the Art Academy, as I wanted to be near other figurative artists, and really make use of everything the bursary could offer me. It was quite a big decision for me to make at the time, and it quickly proved to be the right choice. There are a number of resident artists at the Art Academy which proved a deciding factor in me taking a studio there, as they were all artists I had admired for a while, mostly through seeing their work in the BP Portrait exhibitions. Among them were Brenden kelly RP, James Lloyd RP, and James Hart Dyke. It was a really inspiring time for me, I got to know Brenden really well, and he became a real support, through his advice and tutelage. I didn’t take part in lots of the courses at the Art Academy, as I was developing my own work independently in the studio, which included commissions received through the RP, however I did make a point of going to Brenden Kelly’s drawing, and anatomy lessons, which I found fascinating and very helpful. I hadn’t experienced this level of tutoring before, and I really think that the advice I received there really helped with my own drawing, and enabled me to clarify and develop new approaches to painting & drawing. For instance the emphasis Brenden placed in the drawing lessons on “edges”, hard, firm, soft, and lost, really helped in developing my artistic vocabulary. Mr Tim Wilbur Headmaster of Rossall School. Oil on Canvas(40x30ins) Commission received through the RP, during my bursary year. By focusing more on this one aspect in my own work, I made advances which in turn fed into my commissioned portraits that I was beginning to receive through the RP. At the same time I was able to go and see work developing in the studios of the other resident artists at the Academy. James Hart Dyke was making work based on his expeditions to the Himalayas, James Lloyd was working on portrait commissions, and his own more personal studio work, and Brenden kelly was creating a colossal painting of the NATO command in Afghanistan, the intricate planning of which probably hasn’t been seen since the Renaissance. A brilliant insight into the planning for this complex painting can be seen on the video on his website. Heatherley’s I found to be incredibly helpful as well. It was so nice to be able to go to a purpose built life room with excellent natural light, and free access to the portrait models. In practice the opportunity was for one day a week attending the Open Studio(but i also managed to attend 2 of the summer courses). Developing work out of a commission situation really gives license to experiment, and this I did on a number of occasions at Heatherley’s. It was a real privilege to have a portrait model sit for me for 4 or 5 sessions, each of about 5 hours, I got a lot out of it. The other aspect to the bursary year were the visits to the RP members. Although I regularly saw Brenden Kelly and James Lloyd at the Art Academy, it was important that I visited other members too. In preparation for the bursary year I began to write to many of the members of the RP to see if they would mind if I visited them to discuss their practices. Many wrote back and were very happy for me to visit. A small number invited me to observe them painting the sitter from life. The following is an example of one of my many visits to the RP members,and my observations of that visit. It is a summary of Andrew Festings procedures when painting a portrait. The first of these bursary visits was to Andrew Festing, who was then the President of the RP. He arranged for me to watch him paint 3 head studies for a large group portrait at his studio in Nottinghill. This was my first official visit of the bursary. His studio was a turn of the century purpose built Portrait Painters studio, with tall north facing windows. It was really interesting to see his methods. For instance how he organised his palette, how he measured the subject before painting, the colour of the priming he used, and the painterly manner in which he realised the head study. There was a strong sense of planning in his process,and a full understanding of what was possible in the time available. Each head study was 6ins in height, a small size, which allowed for sufficient information to be recorded in the 5 or so hours he had for each sitter. It was intended that these studies were then to be used as reference to work from for the large group portrait. It is Andrews method to first establish through measuring the proportions and placement of the subject.This he did using dividers, with arms fully outstretched to get consistent measurements. On a larger portrait this can take a whole day, but in the small studies I observed, he speeded up this part of the process, and in about an hour he had finished taking measurements, and was quickly painting. For these studies he favoured an acrylic priming on linen, which was toned with Burnt Sienna,titanium white and a touch of Cobalt blue, to give a mid warm flesh tone on which to work. The priming helped the process, particularly if paint needed to be removed, as the flesh toned priming still harmonised with the painting, so it didn’t put the eye out when revisions needed to be made. His procedure was to work from the large shapes to the small, quickly establishing the large masses of light and shade and then continuing to work into them and refine the shapes, tones, colours, and edges. Andrew stressed the importance of using the right sized brush for the job; to use the largest sized brush appropriate to the area you’re painting. Often in the paining process he would use cotton buds to remove small areas of paint in order to put a new clean brush stroke down, after one or two uses they were quickly dirtied and discarded. Working in oil paint Andrew uses turps & a little Linseed oil, if necessary, to dilute his paints.His palette includes the following tube colours: Zinc white,Flake White,Cadmium Red,Magenta,Permanent Rose, Naples Yellow,Ultramarine Blue,Cobalt Blue, Viridian Green(occasionally), Burnt Sienna(much used with white, as a basic flesh colour into which warmer and cooler colours can be mixed), Raw Sienna,Raw Umber,Burnt Umber,Vandyke Brown,Ivory Black,Charcoal Grey. For Andrew Festing an average full sized single portrait takes about 6 days to complete, 2 1/2 days -3 days from live sittings, then a further 2 to 3 days finishing up and completing the portrait away from the sitter. The method is Alla Prima, if mistakes are made then the paint is wiped off and started again. The Alla Prima method means that when faced with the challenge of a larger portrait, for instance a full length portrait, Andrews method is to concentrate and finish each section before starting the next. For example after measuring and planning the picture, he would complete the head on day 1, on day 2 complete the painting of the clothes, on day 3 complete painting of the hands. Only doing enough as time allows to fully complete each section at a time. This way the painting remains fresh and the brush stokes retain their vitality. Andrews use of brushwork and order of painting is very considered. The basic method is the classical way of working from large to small masses. Andrew works in a very painterly way which is evident in his paintings. For example when painting the mouth of a subject, first would be placed the general warm tone of the lips in a very rough manner without too much thought to their actual shape, this would then be shaped and refined, by working the flesh colour around the lips, and finally adding the lights and darks to complete. Again with painting an eye for example there would be an order, starting with painting the iris as a large rough mass, which would then be shaped by adding the whites of the eye, adding the pupil,followed by the the large eye lids, and finally having done the ground work, a single uninterrupted brush stroke to indicate the line created by the eye lashes, and the edges of the eye lids. A final observation that Andrew showed me about his work, was a method he uses to get colour vibration(the play of warm & cool colours) in the shadows. To do this Andrew will initially lay in the shadow of a face in relatively cooler tone then he intends to finish with, after about an hour has passed he will return to the shadow area, and place a relatively warmer (but same tone)on top of this, in a broken manner, being very careful not to take up or mix too much with the underlying paint, cleaning his brush after each stroke so as not to muddy the colours.The result is a shadow tone that reverberates in colour, more than it would if it were just painted solidly. I will be showing work at this years Royal Society of Portrait Painters exhibition. The exhibition runs from the 6th to 21st of May, at the Mall Galleries in London. I hope to attend the private view on 5th May. I’ve have also delivered paintings to a new Gallery in Brecon, Oriel Pen Y Fan. I’m exhibiting recent landscape work & still Life. First off a brief introduction to what you’ll likely find here in the future… I’d like use this blog to share some of my thoughts & ideas on contemporary painting practice. I’d also like to share ideas I’m developing in my own practice as an artist & portrait painter, mostly from a practical point of view. I hope this blog will develop into something useful for readers with an interest in contemporary figurative art practice. I’m nearing the end of a portrait commission. As with most of my work, I like to feel that I’m pushing the boundaries in some way, and learning something new that will help me get a little bit better for the next time. Sometimes(quite often) these personal discoveries are very simple alterations to my artistic practice, but have much wider implications to the work I’m able to produce. Yesterday I made one of these changes. I made a large palette from a sheet of glass(something I’ve seen many artists use, but have not until now tried it for myself). The surface is fantastic for mixing on, its easily cleaned(without using spirits), and placing a warm grey mid toned paper underneath gives an excellent neutral colour to judge mixes against. The feel of the brushes against the glass surface is good, & helps engender a feel of sensitivity to brushwork when painting. It immediately made a very significant difference to my colour mixing, I was much better able to judge the subtle shifts in colour on the new palette. compared to the previous hand held wooden palette I was used to using. Think I might find a way to paint my wooden palettes a similar neutral colour.The small change makes a big difference.